« Church of Craft singers! Great news, Bay Area crafters…. we’ve booked Citizen Space for a few fabulous Church of Craft Sundays! August 23rd – great time, thanks for coming! September 27th – great time, thanks for coming! October 25th, 12-5pm <– join us! Citizen Space is super easy to get to: A breeze to get to w/ public transportation (only 4 blocks from BART – yes! ), or super easy to park, if you drive (downtown on Sunday = free meters). Entrance is easy – it’s on the ground floor, so simply enter through the large industrial garage door that will be wide open! It’s a nice big, bright space with lots of tables & chairs. Newcomers always welcome!! 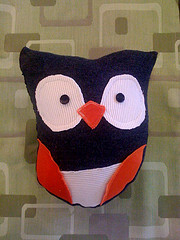 CRAFT-ON, 12-5 pm: Bring your new or continuing craft projects to work on with your fellow crafters. 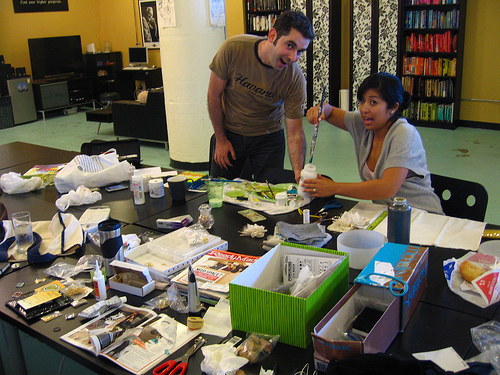 As always, you can craft during the swap, come and go open house style, and potluck snacks are optional. This Sunday I will bring craft supplies for you all to create things with! It will be a smattering of things (magazines, glue & posterboard for collages, my button maker, jewelry stuff, paints, etc). YES! I know you’re all creative and it will be (always is) super fun to see what’s created throughout the afternoon. If any others feel like bringing extra crafty project items to share, too, that’d be wonderful. I’d love to see this Sunday be our biggest SFCoC yet, so please join us & bring a friend! If you have any questions at all, please leave a comment on this post, call or email the SF Church of Craft Coordinator (me), Willo at 415-505-5507. This entry was written by Willo :: WilloToons.com, posted on October 23, 2009 at 11:49 am, filed under Events, San Francisco/Oakland and tagged San Francisco/Oakland. Bookmark the permalink. Follow any comments here with the RSS feed for this post. Post a comment or leave a trackback: Trackback URL.